Get Vendio Gallery - Now FREE! Exquisite Antique KPM Porcelain Plaque Artist Signed Ullmann Woman & Tambourine. Exquisite Antique KPM Porcelain Plaque Artist Signed Ullmann Woman with Tambourine. The image size of the plaque not including the frame is 7-1/2 inches wide by 10 inches high. The framed size is 15-5/8 inches high by 13 inches wide. The plaque is artist signed Ullmann in the lower right. This is a superb hand painted artist signed antique KPM porcelain plaque the colors are extremely vivid and very vibrant. The woman actually looks alive. The plaque has a lovely gallery quality gilt wood frame with a beige suede matte that compliments the colors of the painting on porcelain plaque. 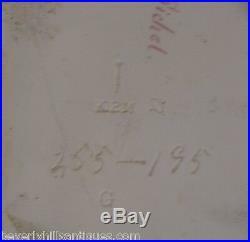 The back of the plaque is titled, numbered and also has the KPM markings. This is the best quality KPM porcelain plaque. Guaranteed to please as are all our items. We are happy to assist you. All items offered are guaranteed genuine and accurately described. We do not mark merchandise values below value or mark items as "gifts" - US and International government regulations prohibit such behavior. The item "Exquisite Antique KPM Porcelain Plaque Artist Signed Ullmann Woman & Tambourine" is in sale since Monday, November 23, 2015.